You want your beads to be preserved forever? Showcase them in metal findings and set them with resin or diamond glaze. 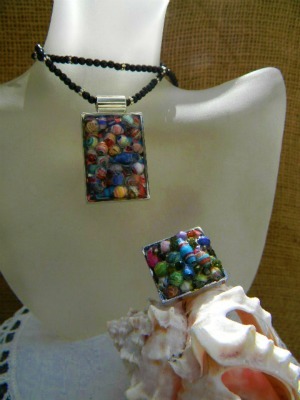 This way you can admire and your beads and it hides whatever flaws they may have. But then again, I always say that flaws give a piece character because nobody is perfect right? Sprinkle 3mm swarovski crystals to give it a little sparkle. Such a great idea! I think that im going to do this now. I think this square ring is beautiful! I love it because it makes a great extent on the finger … impressive! it’s a nice mix of paperbeads !